You’re ready to ditch your comfort zone, take massive action and dramatically increase your visibility in your industry. You’re doing well in your business and feel like the pieces are falling into place. As you’re streamlining and outsourcing, you’re finding you finally have the space to take on new projects and add additional streams of revenue to your business... but how? You have valuable knowledge to share, but are unsure of how to bridge the gap from “online business owner” to booked and paid speaker! You don’t where to start… but you’re ready to take action. Hands down, the best way to create speaking success is to execute a speaker sprint. 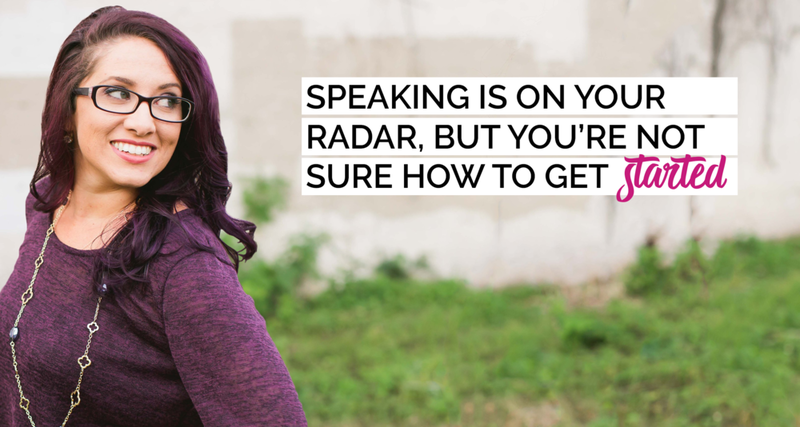 Trust me, it’s the exact strategy I used to jump start my speaking career (and my clients’). What’s working and what needs improvement? I’m going to assess what you already have in your business to determine what we need to refine and what we need to craft from scratch. No need to reinvent the wheel -- you probably already have a lot of the pieces to the puzzle. Maybe you’re just putting them in the wrong spots. We’re going to set you up with the essentials to take action, NOW >> Your Pitches & Your Talk! That’s right, we’re going to craft THREE presentation pitches (topics, titles & take-aways) plus your signature presentation outline. You’ll be confident pitching your favorite events as soon as we’re done with our call. We’ll map out your action plan for the next 90 days. We’ll break down exactly what you should be doing so there’s no more guessing. You’ll know exactly what content you should be creating, what events you should be reaching out to, what relationships need fostering, what opportunities you should be seeking out, and what materials you need to craft. First, you’ll pick the best time for your schedule and book our call. Next, you’ll fill out the intake questionnaire and send me any existing documents you have. This will allow me to doing some research and prep your audit before our call. Then, we’ll jump on a 3-4 hour one-on-one virtual intensive. After our call, I’ll deliver your Speaker Jump-Start Report (and your call recording to replay as many times as your heart desires). This comprehensive document will break down exactly what you need to be working on over the next 30-90 days. Adios, decision fatigue-- this sucker is making room for intentional action! The best part? You’ll have me in your corner for the next four MONTHS! Even though a speaking sprint is the secret to jumpstart your success… at the end of the day, speaking is a marathon and I want to run alongside you. For four months following our intensive, you’ll have virtual support from me each and every week. I’ll be checking in on you and helping you along the way. As you’re cranking away on your game plan questions are bound to come up. Need help negotiating a speaker fee? Want feedback on an application or pitch? No worries, friend -- you have a speaking coach in your corner. You’ll have direct access to me via Voxer Monday-Friday during office hours. Ready to schedule your speaker jump start? Just click the button below to below the enrollment process! Still have questions, comments or concerns? Want to be sure this is the best fit for you right now?